Riding on the coat tails of the commercial and critical success of the Crash Bandicoot N.Sane Trilogy remaster, it looks like we could see our favourite marsupial and his fury friends are making a comeback to the kart racing genre. After Mario Kart moved some serious numbers on the Nintendo Switch, it's clear gamers still hold a strong affinity for the genre. 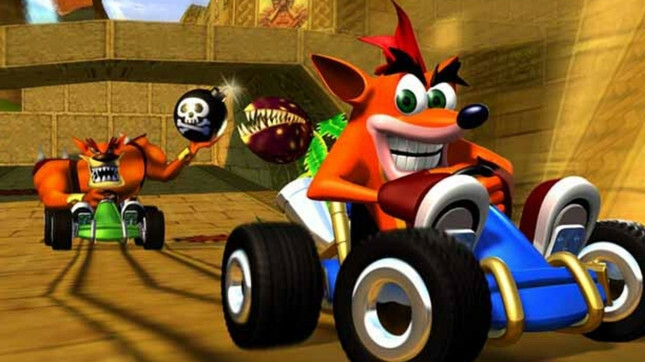 Older PlayStation fans will likely have fond memories of Crash Team Racing and it would make sense for Activision to pounce on that gap in the market for PlayStation and Xbox gamers. This new rumour comes via PlayStation Access presenter Hollie Bennett, who tweeted a picture of a pair of bright orange fluffy dice accompanied by a card that reads "sliding into the Game Awards on 6/12 - Anonymous". It's hard to imagine what else this could be other than an impending announcement for a new or remastered entry in the Crash Team Racing franchise. The 6th of December just so happens to be when the 20198 Game Awards are taking place and we already have confirmation that over ten new announcements will occur during the show. It's not a stretch to assume one of these will be Crash related, especially considering the fan outcry that the original game was nowhere to be seen on the newly released PlayStation Classic console. We'll be tuning in with everyone else on Friday to see what exciting announcements come out of the 2018 Game Awards. What other announcements would you like to see at the show? Let me know in the comments below!